Operation Orion 2005, the fifth Overseas Community Service project undertaken by the NUS Civil Engineering Club, lasted from 26th May 2005 till 8th June 2005, taking place in Balapitiya, Sri Lanka. 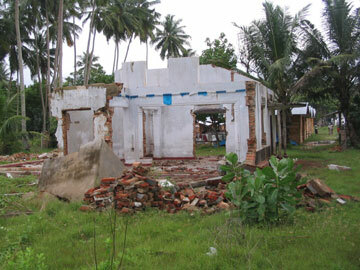 This is in light of the Tsunami disaster on Boxing Day, 26th December 2004. There were two parts to this project. The first part being the Service Project in which we were to build 1 bed and 1 shelf for each of the 131 families allocated to us. In the Learning Project, we interacted with the kids there through various activities. As there were no teams working on similar projects at that location before we were there, much time was spent settling down as well as ordering the required materials and tools. These caused us some delay and we were only able to start on making shelves on 28th May and the beds 30th May. Also, due to constraints in materials, we were only able to make 120 shelves and 97 beds. Our Learning Project was a great success. We taught the children origami, balloon sculpturing, a variety of games and held a colouring session. The children’s artworks were used to decorate the communal hut. Besides beds and shelves, we also gave out a torch and a playpack to each family at our allocated site. Each playpack contains writing materials such as pencils, drawing books, crayons etc. The language barrier could not prevent us from sensing the gratitude of the people when we hand-delivered the items to them. It was heartwarming and filled us with a sense of satisfaction while serving as a reminder to us of how fortunate we are. We were further inspired by the people’s bright and optimistic outlook towards life as well as the way they cared for one another. Children orphaned by the tsunami disaster were not left to fend for themselves but were cared for by one and all. For most of us, it was our first time handling hammers and saws. Needless to say, most of us suffered minor injuries but nothing that wouldn’t heal within a couple of weeks. Living conditions were simple and we had to adapt to sleeping in sleeping bags on cement floors and using well water for non-drinking related activities such as the washing of clothes. Furthermore, we found it hard to adapt to the food in Sri Lanka. We overcame this problem by preparing our own meals. Only a few of us were adept in cooking and the rest of us took turns in learning from them and helping them out in the kitchen. Millipedes were a common sight and we soon grew accustomed to seeing them around. Snakes were a different matter. One found its way into our laundry area one afternoon, getting us all panicky. We managed to chase it away with the help of some neighbours. That was not the only time the neighbours rendered us help. When they discovered that the roof of our living quarters leaked whenever it rained, they offered to fix the problem for us and climbed up onto the high beams near the roof to search for and replace the broken roof tiles with new ones. All in all, through cooperation, endurance and determination, we overcame all obstacles and have achieved our motto: “Enrich ourselves, Benefit others”. We couldn’t have done it without the warmth and help from the locals and would like to thank Singapore International Foundation, NUSSU, Civil Engineering Club, Dr. Chew Soon Hoe and NUS Civil Engineering Department for your support, as well as all who had helped us in one way or another.